Braising is a great way to add flavor to mild-tasting fish, it's a mess-free alternative to cooking in oil in a skillet, and it doesn't take much longer to execute with fish. You may be used to pan-searing thick-cut white fish fillets any time you take them home from the market and want a quick dinner, but it’s worth it to try a different technique. Braising is a great way to add flavor to mild-tasting fish, it’s a mess-free alternative to cooking in oil in a skillet, and it doesn’t take much longer to execute with fish. Using cherry tomatoes and making a white wine sauce in the pan made the dish fresh and bright_perfect for pristine white fish. Cooking the fillets among sauteed leeks imparted a subtle sweet flavor to the fish. To ensure the fish cooked through gently and evenly, we turned down the heat and covered the skillet so the fish both simmered and steamed. A pat of butter swirled into the resulting sauce contributed richness. 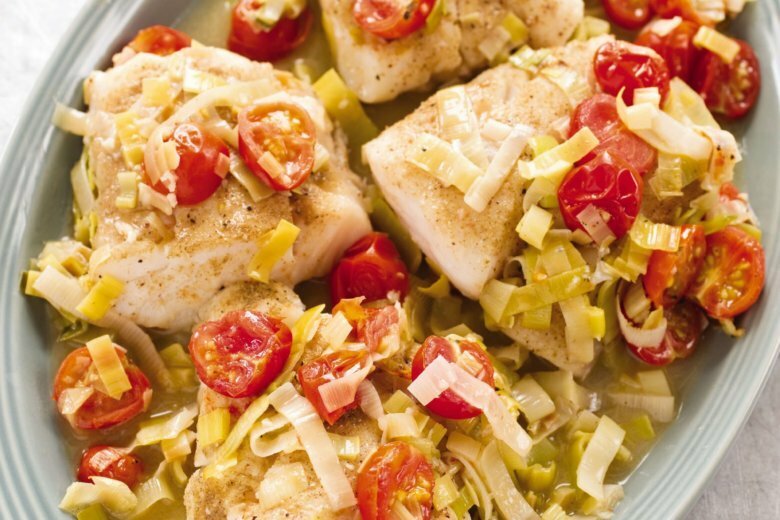 Haddock, snapper, tilapia, bluefish, monkfish, and sea bass fillets are good substitutes for the cod. Melt 2 tablespoons butter in 12 inch nonstick skillet over medium-high heat. Add leeks and 1/4 teaspoon salt and cook until softened, about 5 minutes. Stir in garlic and cook until fragrant, about 30 seconds. Stir in tomatoes, wine, and 1/4 teaspoon pepper and bring to simmer. Pat cod dry with paper towels and season with salt and pepper. Nestle cod into skillet and spoon some vegetables and sauce over top. Cover and reduce heat to medium-low. Cook until fish flakes apart when gently prodded with paring knife and registers 140 F, 10 to 12 minutes. Carefully transfer cod to platter. Stir remaining 1 tablespoon butter into vegetables, season with salt and pepper to taste, and spoon vegetables and sauce over cod. Serve. Nutrition information per serving: 372 calories; 95 calories from fat; 11 g fat (6 g saturated; 0 g trans fats); 120 mg cholesterol; 443 mg sodium; 20 g carbohydrate; 3 g fiber; 7 g sugar; 43 g protein.